On April 1, the World Affairs Council of Connecticut hosted the program “Fighting Below the Belt: Global Cyber Terrorism” as part of our Global Conversation Series. We invited three well versed men to explain the complicated subject and facilitate a discussion about cyber terrorism and how it touches our lives. Lawrence Husick, William Shea, and Arthur House each shared their expertise and expertly responded to questions posed by the audience. Lawrence Husick is the Co-chair of the Foreign Policy Research Institute’s Center for the Study of Terrorism. There, he concentrates on the study of terrorist tactics and counterterrorism strategies, focusing on the use of technology as a modern terror tactic. To read more about Lawrence Husick, click here. 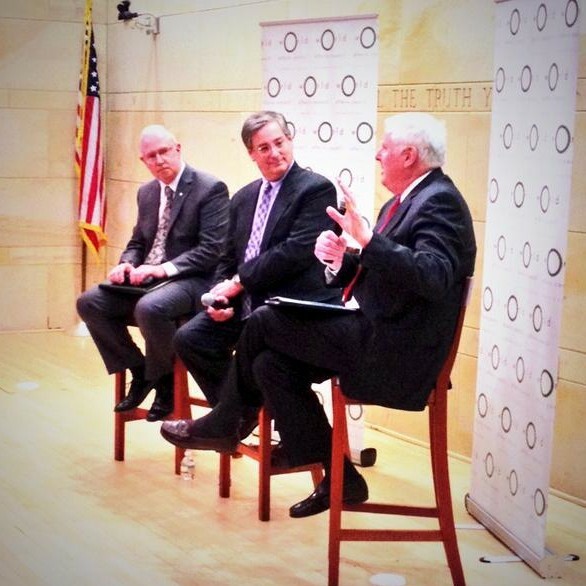 To listen to Husick explain cyber warfare, click here. Colonel (Retired) William P. Shea is currently the Deputy Commissioner (D/C) of the Department of Emergency Services and Public Protection (DESPP) responsible for the Division of Emergency Management and Homeland Security (DEMHS) for the State of Connecticut. D/C Shea also serves as the Homeland Security Advisor to the Governor. To read more about Col. (Ret) William Shea’s organization, click here. Arthur House is currently the Chairman of Connecticut Public Utilities and Regulation Authority (CT PURA). He was appointed to this position by Governor Dannel Malloy in 2012. House has a Ph.D. in international relations from the Fletcher School at Tufts University. Arthur House’s experience extends to matters of national security, international affairs, government relations and global corporate relations. House’s varied corporate, governmental, and international experience lend him the knowledge and analytical skills necessary to interpret the current state of intelligence affairs. To view more Arthur House, click here. The men made up the panel for the discussion on cyber security and cyber terrorism – an ever-present threat. The program was kicked off by opening remarks from our newly appointed Executive Director, Megan Torrey. Arthur House spoke first after Megan, opening the discussion by explaining the basics of cyber terrorism and the threat it plays in a modern society. Husick followed House, and shared his expertise on cyber security and its impact on daily life and our globally connected world. Each of the speakers stressed the point that in the modern society we live in, every person is technologically connected. There was once a common belief that remaining obscure eliminated risk of cyber attacks. The panel debunked this theory by emphasizing the hyper connectivity that characterizes today’s society and pointed out bluntly that avoiding threat by obscurity is no longer possible. After the men each shared their opening remarks and explanations of their positions in the field of cyber defense, the panel opened the floor to questions from the audience. The audience was very interested in the expertise the panel shared, and posed thought-provoking questions that sparked great discussion. Q: Who poses a larger threat of cyber terrorism: a lone hacker or a foreign government? The panelists each had their own response to which entity is a larger threat, however they came to a consensus on one response for sure: the biggest threat is not the size of the cyber attacker, the biggest threat is the insider. Q: Who is more susceptible to a cyber attack, individuals or large corporations, like the insurance companies in Hartford? The panelists agreed that everyone is susceptible to an attack, but the attacks would be probing for different kinds of information. Attacks on individuals would most likely be searching for personal data, while attacks on larger companies, like the insurance companies in Hartford (a commonly used example in the Hartford based discussion) would be more likely to be perpetrated for corporate information and infiltration rather than personal data. Q: Are closed systems less susceptible to attack? The panelists firmly stated that closed systems are NO less susceptible to attack. There was once the belief that if an “air gap” existed, meaning that the system was not connected to the internet, then cyber attacks would not be possible because the data could not be transmitted. “Air gaps” have been proven penetrable, most recently with the Stuxnet attack in Iran. The panelists then went on to explain that there are methods of infiltrating a system through physical means when there is no technological connection. There are now programs that can transmit information via sonar into audio devices like headsets or speakers. Or like the system breach at Target, the network was infiltrated through the ventilation. Husick, Shea, and House provided an expert, informative, and lively panel discussion of cyber security and terrorism for our Council audience. We at WACCT are now much more informed and alert (scared) to the threat that cyber terrorism plays in our modern world! Previous Post St. Patrick’s Day in Ireland! Next Post Meet Our Team of Interns!